We include the most popular definitions you will need to know to navigate your way around the cryptoverse. The term traditionally means spreading doubts about a competitor’s product but in crypto it means spreading fear, uncertainty or doubt about a specific blockchain project. 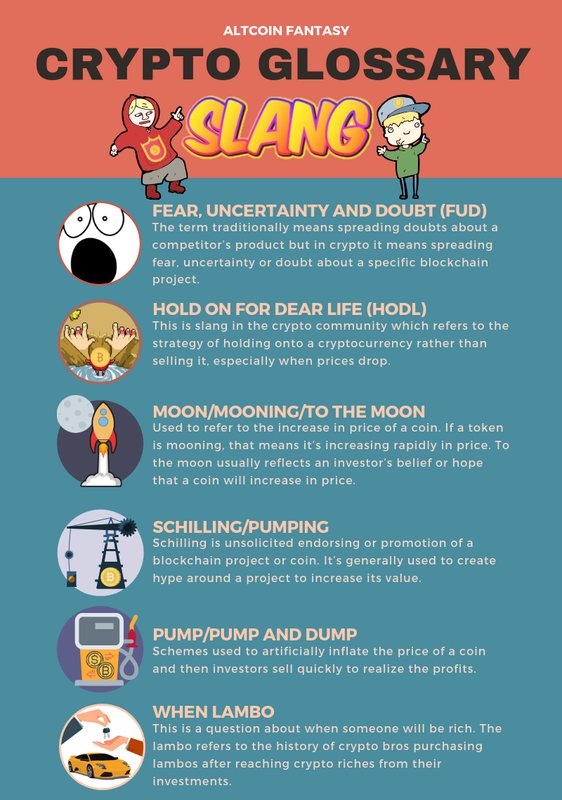 This is slang in the crypto community which refers to the strategy of holding onto a cryptocurrency rather than selling it, especially when prices drop. Used to refer to the increase in price of a coin. If a token is mooning, that means it’s increasing rapidly in price. To the moon usually reflects an investor’s belief or hope that a coin will increase in price. Schilling is unsolicited endorsing or promotion of a blockchain project or coin. It’s generally used to create hype around a project to increase its value. Schemes used to artificially inflate the price of a coin and then investors sell quickly to realize the profits. This is a question about when someone will be rich. The lambo refers to the history of crypto bros purchasing lambos after reaching crypto riches from their investments. Bitcoin is the very first cryptocurrency created on a blockchain. It’s used as a means of payment between two parties. Its creation is attributed to Satoshi Nakomoto, which is the name used by the anonymous person or people who created Bitcoin. A satoshi is the smallest value of a Bitcoin that’s recorded on the blockchain. It’s equivalent to one hundreth million of a Bitcoin, or 0.00000001 BTC. Any cryptocurrency other than Bitcoin. The name is derived from the fact that all other coins were created as an alternative to the original Bitcoin. Cold storage refers to keeping cryptocurrencies offline and not connected online to prevent against hacking and cyber attacks. This could take many forms including putting the information on a USB drive, purchasing a hardware wallet or keeping a piece of paper with your information in a safety deposit box. A fork is a point where a blockchain splits into two separate chains due to new rules built into the blockchain code or the majority of miners of that blockchain wanting to split off into another blockchain. An initial coin offering is a way for blockchain projects to raise funds for their company by selling their own tokens. Similar to an ICO, except these are securities and the tokens you purchase are backed by something tangible in the real world like physical assets, profits or revenues. A software wallet is a digital wallet to store cryptocurrencies which is kept completely online. A bear market is a market in which crypto prices are decreasing. Someone who is bearish expects the market tio keep going down and for things to get worse before they get better in the markets. A bull market is a market in which crypto prices are increasing, raising the overall value of all cryptocurrencies. Someone who is bullish expects the market to keep going up. This is a term that was traditionally used in stock trading. An exchange is a place where you can buy or sell cryptocurrencies. Currency that is issued by a government. Examples include the US dollar (USD), the Hong Kong dollar (HKD) and the Euro (EUR). These are orders that are placed by cryptocurrency trades to either buy or sell a specific crypto when the price meets the pre-determined price. For example, if the current price of Bitcoin is $6,000 and a trade places a limit sell order of 1 token at $6,500, when the price reaches $6,500, the Bitcoin will automatically be sold at that price. A market cap is the total value of a cryptocurrency given the price multiplied by the total supply of coins. A stablecoin is a cryptocurrency that is pegged to a stable asset, such as the US dollar, gold or another commodity in order to reduce the volatility of the value of the coin. These two terms refer to analyzing cryptocurrency price charts to predict how the market will move in the future. This is an investor who holds large amounts of cryptocurrencies. A Bitcoin whale is a Bitcoin investor who holds a large amount of Bitcoin. Dapps stand for decentralized applications. These are apps that are written on a decentralized blockchain. This term is specific to the Ethereum blockchain and refers to the amount of processing required to process a transaction. Small transactions require small amounts of gas while more complex transactions such as the ones on a smart contract will require more gas. This is the amount of Ethereum required to power a transaction. The initiator of the transaction pays for the gas. Transactions which have higher gas prices are prioritized on the blockchain network. Conditions written on the Ethereum blockchain that allows specific transactions to happen when predefined conditions are met.